Jimi Manuwa planted a massive left hand to to the chin of Corey Anderson to leave UFC Fight Night London with another impressive victory. 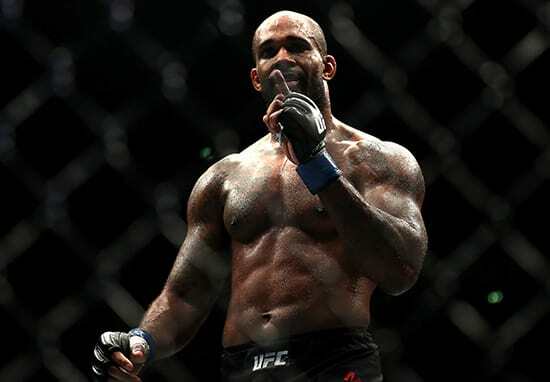 Joe Rogan hailed Manuwa pre-fight as a true knockout artist, and ‘The Poster Boy’ lived up to the billing. He sent Anderson craching to the canvas with just under two minutes of round one remaining. And as is seemingly the done thing nowadays, Manuwa took a moment after his victory to call out boxer David Haye. Brad Pickett’s final bout inside the Octagon would end in defeat, however the London fighter went down swinging. ‘One Punch’ had looked comfortable against Marlon Vera, and the fight seemed destined to reach a judge’s decision – but with little over one minute remaining in the final of three rounds a brutal head kick brought the curtain down on Pickett’s UFC career. That is how you finish a fight! All that was left was for Pickett to soak up the adulation of a home crowd in London, before leaving that infamous trilby in the middle of the cage. Meanwhile Gunnar Nelson earned a second-round victory over American Alan Jouban via submission. A heavy right hand from the Icelander rocked Jouban before Nelson pounced to lock in a guillotine his opponent would not escape. What a night it was at the O2!